extra apron...I know I could. It's always makes me feel great to have on a cute apron while cooking...how about you? Becky has a lot more than just aprons, so go by and check out all her beautiful items. Thanks Becky for being a part of NTT this week. Okay ladies, I almost forgot to announce the WINNER of last weeks giveaway...Laurel at CHIPPING WITH CHARM you have WON that cute cute FLORA DOORA...please e-mail me with your mailing address...congrats and I hope you enjoy using it in your home...I sure do enjoy mine. Now let's get this party started...link her up! * 2 entries-go by and visit Becky at CLASSY SASSY COUTURE and LIKE her on FACEBOOK and come back and let me know you did this. * 2 entries-go by and check out all the beautiful items that Becky has to offer and come back and tell me what your favorite item is. *1 entry- become a Coastal Charm follower (if you are already one...just let me know). *1 entry -link up to NIFTY THRIFTY TUESDAYS and leave a comment. *1 entry-blog about the giveaway or add it to your sidebar and come back and let me know. More white ironstone to add to my collection! Got this cute basket for FREE!! You're going to post how the basket turns out, right...? Wow I can't believe what bargains all your finds were this week. I'd love to find a tray like that, and that milkglass and ironstone stuff is gorgeous. 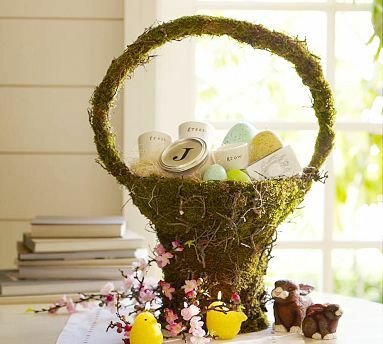 We don't have Pottery Barn in the UK but I've heard a few people talking about moss baskets - now I understand! You sure did find some fabulous deals....Love those vases and flowers always seem to give it a whole new look. The apron is so pretty too...I will be adding a thrifty find makeover to the party as soon as I am finished doing it. Thanks Linda for hosting....are you having fun at the beach?!!!! Love all the thrifty finds you have.....I'm all over anything white! Cute basket too! Great thrifty finds, I love milk glass its timeless and goes with all sorts of decor. I've hit a thrifty slump lately at the Goodwill, hopefully it will pick back up soon. Love the black & white flirty apron! Wow, you did good and got some great thrifty goodies! I can't wait to see what your basket turns out like!!! Happy Monday...now off to visit some of your linky friends. I love the blk and white apron! Great finds! Love all your milk glass. You sure know how to find bargains. I didn't get to go shopping this week so I don't have anything to link....but I am a follower! I am a follower!!! Thank you for the great giveaway and count me in. Love all your thrifty finds! I'm anxious to see YOUR PB Basket! "Where is the blog party TUESDAY TREASURES"??? I can't seem to find it??? Love all your ironstone! You always find the best stuff! I've also been working on a PB knockoff moss basket. I had some leftover moss from my moss wreath that I linked up, and thought, "Why not?" It's going on my spring mantel. Thanks for sharing and for hosting this terrific giveaway. I absolutely adore the green sleeveless v-neck dress she has on her site. Gorgeous! I'm, of course, a follower, too. Lovin' your blog! Thank you for stopping by mine and inviting me to join in on your link fun! Oh Linda, you got some great thrifty finds! Love it all! I am a sucker for milk glass. Major sucker. Love it. Oh I love your white ironstone! And your milk glass! I have several pieces of Milk glass myself! Great giveaway! I'm a follower!!!! Thanks a bunch for hosting!!! I love the black wedges, for sure!!! Love all your milk glass. Those milk glass bud vases are gorgeous. I have the same ironstone sugar and creamer. It was my first set of dishes when we got married! My mother gave the entire set of dishes to me. I also have several of the milkglass bud vases! You got some great deals this week and I can't wait to see your basket! Thanks Linda for visiting my little blog. I am your newest follower. Linda, I love the white creamer and sugar bowl and the silver tray. Great finds. Thanks for hosting. I forgot to link this till now. What great finds you got. I can't wait until garage sailing season starts up here again. I really miss the hunt! Thanks so much for inviting me to your Nifty Thrifty Tuesday Party! What great finds! Love the white iron stone & I cannot wait to see what you do with the basket. I am a follower and am linking up today! Thanks! I can't believe all the great treasures you found this week. I linked up my pen and ink sketch that I found at a thrift store recently. I have yet to get it framed. Thanks for hosting the linky party. Great finds. I can't wait to see the basket when you finish. I love anything ironstone and milk glass. Add flowers and life is good :) Hope you had a nice time this weekend! Can't wait to see how your basket turns out. You can't beat the price. Very pretty! You need to come down to a little town called Sasser, Ga. I have literally found milk glass bud vases there for ONE PENNY! They have an area where they put random things for a penny. I am always excited to see what's there. Thank you for stopping by Sage and Cocoa and checkin' it out. :) I linked up here on Coastal Charm as well. This is such a beautiful and elegant apron! Thank you for the giveaway. I just liked classy sassy couture on Facebook. Everything is so pretty on her site. This giveaway apron is lovely...and the Green Sleeveless V-Neck Dress on her site really caught my eyes. So beautiful and perfect for spring! There is something so charming about vintage aprons...love them. I have the same Johnson Brothers ironstone dinnerware...my mother gave me her whole set...enjoyed seeing your pieces. And the Pottery Barn knock-off is great...I love copying ideas from their catalogue on the cheap...kind of an on-going challenge for us DIY types. Love your blog! I linked up, love aprons too! I follow as well, love the creamers. Thanks for the invite! great site, I'm following! Linda, I visited Sassy Classy Couture and I love the black wedge sandals. Forgot to mention I am a follower on FB too. What a fun party and I just adore the vase! I so love your finds! I need to go thrifting with you! The black and white apron is adorable. I love the Johnson Brothers pitcher and sugar bowl too. I have a large collection of those dishes and use them everyday. They're so versatile and beautiful. I can't wait to see the moss covered basket. That sounds delightful. Thanks for hosting! i love milk glass, can't wait to see the finished basket, i'm sure it'll look even better than the inspiration! thanks for sharing it at my party! I love the way you thrift! 25, 50, and 75 cents are my way to shop! That way, I don't even feel like I've spent anything :D Love the blog! Thanks for visiting our blog! I totally linked up! Love linky parties! I'm your newest follwer too! Can't wait to see your posts in my google reader! Hi Linda...you found some pretty white glass! The basket looks like a longaberger...cant wait to see your creation. Thanks for the party, the apron is awesome and I'm a big nerd and linked up without a pic on one, so I reentered my nerd baby shirt. Wow, they were all great deal! Love the ironstone. Where does time go???? Thank you for hosting Linda, and I am sorry that I am late! PS, the beach house looks great, love the monogram! Hi Linda, I'm a new follower. I found your link @ The Thrifty Home. Can't believe your great finds this week! Love your style, as I also live on the coast, the west coast to be specific. Looking forward to checking out the other links here. I liked Classy Sassy Couture on FB! My fave item is the beaded sandal wedges!! I have been a happy follower for awhile now!! I linked up my project! Added your giveaway to my sidebar! Thank you for hosting a great party! I'm a day late but better late than never! Hi Linda! Oops, missed the linky party (I usually participate) but I can at least tell you that I'm already a follower and am throwing my chip into the game to win that adorable apron! Just 'liked' Classy Sassy on Facebook!